Here’s another blog post that shows how the Day-Night Band on the S-NPP VIIRS instrument can help with power outages after a significant tornado! This blog post was written by a post-doc at NASA SPoRT and she talks about how the RGB Dust product can be used to detect volcanic ash! Mount Pavlof, one of Alaska’s most active volcanoes, has been erupting since last week. The plume has caused some disruption of flights and ash fallout in nearby communities. 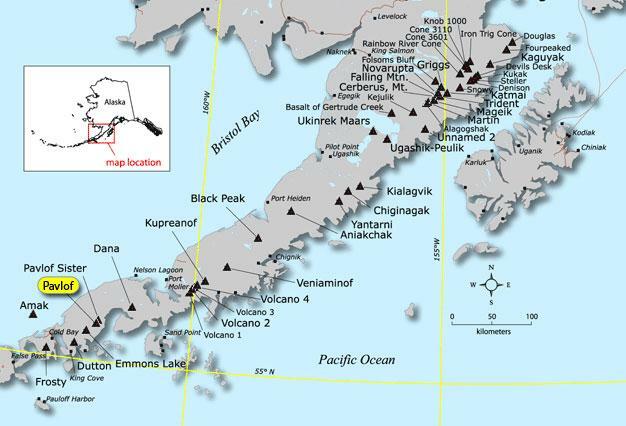 The Alaska Volcano Observatory has been closely monitoring it’s activity (http://www.avo.alaska.edu/activity/Pavlof.php). The steam, ash, and gas plume is continually created as hot lava contacts snow and ice. The steam, ash, and gas plume has occasionally reached up to 20,000 ft and has been carried downwind as much as 100 km to the northeast, east, and southeast before dissipating. This graphic from the Alaska Volcano Observatory shows the location of Mount Pavlof within the Aleutian Island Chain. The plume can be seen in the VIIRS RGB Dust product. Let’s first look at the VIIRS true color product. Inside the red circle, you can see a faint brown plume, but it’s not easy to see (click on the images). The last two weeks have featured some rather remarkable weather that has ranged from morning lows around freezing, high temperatures soaring way above 100, and unfortunately, some deadly tornadoes. As part of the Satellite Proving Ground at the NOAA Center for Weather and Climate Prediction (NCWCP), we are currently demonstrating some products that will help with diagnosing and forecasting convection. The Overshooting Top Detection (OTD) is the first product that forecasters are evaluating and in the next few months, we will introduce a new lightning density product (see earlier post on the first spring MCC) that utilizes the Vaisala GLD-360 lightning feed to create a density plot of lightning strikes. As many of you know, the evening of 05/15 brought some very severe weather to the Dallas-Fort Worth metro with at least one EF-4 and one EF-3 tornado in the southwest suburbs. These storms were part of a larger scale system that was rotating through Oklahoma and the two products mentioned above provided some very interesting and useful information about these storms. GOES-13 Infrared satellite image with the Overshooting Top Magnitude product overlaid valid at 0102 UTC on 5/16/13. The image above was taken approximately four minutes before the first report of this eventual EF-4 tornado touched down in Granbury, TX. The Overshooting Top Magnitude product adds more information to the overshooting top (OT) associated with this supercell thunderstorm than just the fact that it exists. The OT is approximately 9-11 degrees Celcius colder than the surrounding cirrus of the anvil. This could indicate the potential for large hail and in this case, a precursor to the tornado. Typically, the severe weather occurs between 5-30 minutes after the time of the OT detection. 2 km Mosaic Base Reflective Radar valid at 0104 UTC on 05/16/13. This radar image compliments the satellite image above and is valid approximately 2 minutes before the tornado report was received. The two supercells highlighted are the tornado producing storms west-northwest of Fort Worth, TX. The southernmost supercell is responsible for the OT seen in the satellite image. Although I cannot say with absolute confidence that the OT Magnitude product would have given a strong indication of a potential EF-4 tornado, it did provide information on the most intense updrafts associated with these storms. n GOES-13 Infrared satellite imagery with the Vaisala GLD-360 Lightning Density product overlaid valid at 0115 UTC on 05/16/13. The new Vaisala GLD-360 Lightning Density product that has been developed as a coordinated effort with the Ocean Prediction Center (OPC), NESDIS STAR, and the Cooperative Institute for Climate and Satellites (CICS) did a great job of showing the highest concentration of cloud-to-ground (CG) lightning strikes associated with the thunderstorms about 9 minutes after the tornado report was received. Notice how the two lightning cores are as distinct in this image as the radar image above! This algorithm takes all of the individual CGs (positive and negative) and bins them into 2-minute, 15-minute, and 30-minute lightning density plots. The above image is a 30-minute accumulation of CGs, scaled. The purpose of this product is to simulate the capabilities of the upcoming Geostationary Lightning Mapper (GLM) that will be on GOES-R and is a compliment to the Pseudo-GLM product that is being developed and provided by NASA SPoRT and the University of Alabama-Huntsville. GOES-13 Infrared satellite image with the Overshooting Top Magnitude product overlaid valid at 0232 UTC on 05/16/13. Another interesting caveat of this severe weather event was this unusually strong OT Magnitude signal observed at 0232 UTC. The OT Magnitude exceeded the scale I created for the product with an OT that was greater than 18 C colder than the surrounding cirrus anvil! I’m sure there was significant hail in this area at this time! A Supercell Thunderstorm over the Gulf Stream?! In the early morning hours of 05/16, another supercell formed nearly 1800 miles to the east-northeast over the Gulf Stream, east of the Mid-Atlantic. As a thunderstorm crossed the north wall of the Gulf Stream, it quickly intensified around 08 UTC into a supercell as it moved east over very warm waters. Although not a threat to anyone, the storm was located over shipping lanes and there was a ship located just northeast of the storm during maximum intensity. As you look at the images below, I want you to think about this question: If you observe similar structures and similar lightning patterns to the TX case, and have no radar, is it possible that this supercell was producing large hail, torrential rainfall, microbursts, or even a large waterspout? GOES-13 Infrared satellite image with the Overshooting Top Magnitude product overlaid valid at 0802 UTC on 05/16/13. The image above shows the OT Magnitude product indicating an OT that is approximately 16-17 C colder than the surrounding cirrus! This is very intense for a maritime thunderstorm and indicates this storm most likely exhibited a supercell structure. One of the OPC forecasters noted that this is the most intense thunderstorm he has witnessed over the Atlantic offshore zones in a long time. GOES-13 Infrared satellite imagery with the Vaisala GLD-360 Lightning Density product overlaid valid at 0815 UTC on 05/16/13. Once again, the GLD-360 Lightning Density product shows a very intense core of CG lightning strikes co-located with the OT indicated above. It actually appears the lightning was more intense in this supercell than what was observed over TX a few hours earlier. Once again, I have created animations of this event below for your convenience. Think about the question above when you look at the animations and I encourage you to leave comments or questions as this could lead to interesting discussion. I think these two events provide an interesting comparison and it might be feasible to use these products for maritime convection to warn recreational boaters, military ships, and cargo vessels of potential severe maritime convection. The OPC and Tropical Analysis and Forecast Branch (TAFB) will continue to evaluate these products through the summer as part of the GOES-R Proving Ground activities.